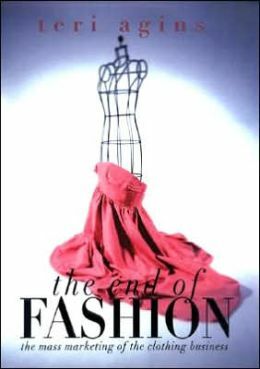 I read "The End of Fashion" so you don't have to. If you have it on your to-read you should probably take it off. I found it mildly interesting as a piece of fashion history, but it was hard to get through. Agins covers, among other things, Paris as the center of the fashion universe, the story of designer/movie star synergy, and the (temporary) reprieve Marshall Field's bought itself as a strictly high-end merchandiser. 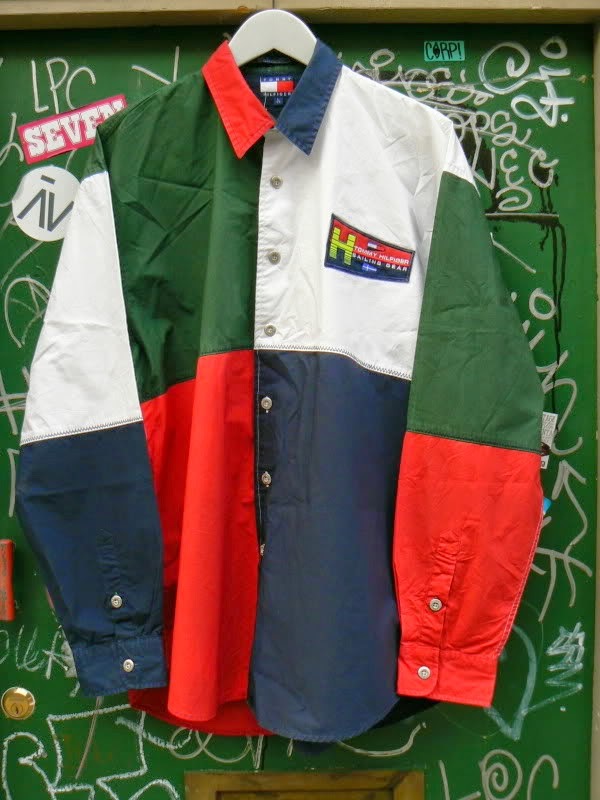 I had to google "Hilfiger Vintage" to find this. Writing in 1998 or so (the book was published in 1999), Agins argues that fashion is dead. Forever. When you read the book you remember why this would be easy to believe: this was the height of Tommy Hilfiger Hegemony, as covered in a chapter of the book. Those hideous oversized color-blocked sweatshirts were all over the damn place. Less facetiously, there was also the perpetual issue of couture being a huge money-loser, and fashion people making very bad business people (the chapter on Donna Karan is a great illustration of this principle). However, the title has more to do with timing than absolute truth. This quote encapsulates the era Agins recounts: "Glamorous as they are, fashion shows are fairly low-voltage to the general public, who will probably never see a tape of an Armani runway show." (p 152). Thank you for that prediction, Professor Trelawney. Ad Copy: Gives Even Svelte Teen Sensations Tummy Pooches! Agins was writing in the dead zone between the easing of American economic protectionism that began to allow cheap clothes from Asia to flood the market (the Multi-Fiber Arrangement was phased out by 2005) and the rise of the fashion blogger. In those dead zone years, fashion was pretty grim. Think of those heinous jeans the 90210 crowd wore(and don't miss this horrendous pair on Shannen Doherty). With the rise of the Internet, the top-down model Agins writes about no longer became the only paradigm. Designers, department stores, and fashion magazines have by no means lost their influence on fashion (as evidenced by the awesome "cerulean" monologue in The Devil Wears Prada). But what used to be "street fashion," which certainly had some influence in the past--though mainly as it was coopted by movie costume designers and the fashion industry--became fashion blogging, and far surpassed the IRL version in terms of influence. As fashion became democratized, couture became no longer the stuffy province of the ultra-rich old money and ordinary people could get excited about and participate in fashion in a way that has not been possible at any other time in history. Someone with a strong point of view could go from being a random teenager in the midwest to seated in the front row at a runway show (or so we like to imagine). In addition, business people started to take over the business end of fashion. Whether LVMH's ownership of a huge swathe of the luxury fashion brands is a good or a bad thing, it has meant that fashion houses have managed to stay afloat and continue to offer couture eye candy. Of course, nothing is static. The new fashion hegemony seems to be that fashion bloggers are sponsored and branded and all strive to be sponsored by (and feature) the same clothes, so there is less of a richness of fashion point-of-view and the designers/marketers are back on top in deciding the Next Big Thing. However, I'm not going to go as far as Teri Agins and predict the end of fashion. Humans will always have a keen interest in adorning themselves, regardless of how low the trough seems to have dipped. 1. I have those jeans from 1994. I couldn't figure out from photos why no one told me they were too big and made me look fat. 2. They make all of them look pouchy. Even Tori Spelling. 3. But, isn't 'real' couture dead? Like the days of the wealthy flying to couture houses to buy their wardrobe for the year and having things custom made? I think there are still people who buy their cloths through couture houses. I just don't move in those social circles. Think wives of Russian oligarchs and Arab sheiks. Not to mention television juggernauts like the Project Runway franchise, and What Not to Wear, and even Fashion Police. There's that, to bring haute couture to the forefront of public consciousness. I'm way more excited about seeing all the Fashion Week peeks than when I worked for Wrangler Corp in the 1980s. I thank you for reading this so I don't have to (as I would have, and cursed the time I wasted throwing it across the room). I had much the same feeling/public warning about "The Lost Art of Dress". A lot of heat and bother about the end of civilization as we know it (and sloppy scholarship, which is my endtimes theme song) due to those damn hippies, who haven't been in fashion for decades. Arguing the other hand, it is interesting to go back and read other dire predictions gone wrong. Writing is of its time (oh no, we're drowning in horse manure from all these wagons! What on earth will we do); timeless writing for the ages is pretty near impossible to do. Hey, I got to use my brain for a minute! Thanks! Interesting post, thanks for summarizing the book. Tommy Hilfiger Hegemony. :) For real? I read this book several years ago. Maybe I misremember, or have misread your review, but it seems to me that you and Agins mostly agree. I understood her title (and theme) to mean the end of top-down fashion paradigm, not only of designer trend-setting but also of heirarchical style sensibility (democratization of taste). Cidell - you should look at "Dior and I" when it comes out - it's fabulous, all about Raf Simmons first season at Dior. But the interesting moment is when the head of sales "steals" the head-fitter and flys her to NYC to placate a "$350,000" client who didn't like the fit of her frock. Obviously there are still some people buying Couture out there! My fashion "head-scratcher" is Tom Ford, whose latest collections are mind-boggling tacky and weak. Yet he is opening store after store. He must know his audience! Very interesting. I'm not sad the "Hilfiger Hegemony" has gone its way. McVal, of course! Publish away.